“He looks like you,” Mavis had said of the garden gnome she’d presented to him for his birthday, which Arthur hadn’t found amusing because it was true. They had the same wispy beard and ruddy cheeks. There was, of course, a height difference, but not by much. Besides that, the only difference was that Arthur wore square glasses rather than round ones. “I got him in this little old junk shop in the next village,” Mavis had chirped. “Never seen it before. Full of weird ornaments and old books. There wasn’t much I fancied, but this gnome caught my eye. The owner wore this big pointy hat, like a wizard. I said, ‘Gosh, is this a magic shop?’ and he just smiled. People like all that hocus-pocus stuff, I suppose. Not sure it’s for me, though.” Arthur had stopped listening around the words “junk shop” and merely grunted in reply. Mavis had named their new companion Ben and plonked him by the flowerbeds, forcing Arthur to endure a constant reminder of his stature whenever he deadheaded the rose bush, as he was doing now. “Dinner’s ready,” called Mavis from the house. As he stood up to leave, his sixty-something knees creaking in protest, Arthur gave Ben a little kick. He didn’t notice the glint flash across its painted eyes as he sauntered up the path to the kitchen. A week later, Arthur was washing the car when he turned around and fell over Ben. “How the hell did you get over here?” he moaned, sprawling on the driveway and examining the hole the tumble had torn in his brand new slacks. Limping, he carried the lawn ornament back to its spot and dumped it down with a clatter. “What are you doing with dear little Ben?” asked Mavis from behind her Jilly Cooper novel. Arthur scowled and, when Mavis wasn’t looking, gave Ben another kick. “No such thing as magic,” he grumbled. The gnome’s smile twisted, but Arthur didn’t notice that either. A few more days passed. Arthur was on his knees again, weeding the begonias. Ben stood about ten feet away. Arthur glanced at him every so often to make sure he hadn’t crept nearer. A particularly thick-stalked weed was giving him trouble. He wrapped both hands around it, heaved, fell over backwards and found himself gazing directly upwards into Ben’s blank stare. “What the bloody hell?” squealed Arthur, trying to scrabble to his feet but succeeding only in falling over backwards and squashing half the flowers beneath his rear end. This would later seriously upset Mavis, who was planning to show them off to the vicar when he came over for tea next week. Somehow, impossibly, Ben slid towards Arthur, inch by inch, slowly, but purposefully. His smile contorted once more. Arthur froze, unable to fathom what was happening. In the kitchen, Mavis thought she heard a scream but it stopped before it had even begun. She shook her head. “You’re getting old,” she thought. Later that afternoon, Mavis and Arthur took tea in the garden. They shared sandwiches, chocolate brownies and a bottle of red wine. As the sun set, casting a shimmering shadow on the flattened begonias – which Mavis had forgiven her husband for when he brought out the booze – Arthur caught Mavis by surprise by leaning in to kiss her. Arthur nodded vigorously, grabbed Mavis by the hand and escorted her towards the house, leaving the picnic detritus on the lawn. “What about the rubbish?” said Mavis. “Leave it for tonight,” said Arthur. From his post by the rosebush, the gnome watched them walk towards the house, arm in arm, until the door closed behind them and the bedroom light clicked on. A tear slid from beneath the square frames of its glasses. David Cook’s stories have appeared in the National Flash Fiction Anthology, the Sunlight Press, Spelk and more. He lives in Bridgend, Wales, with his wife and daughter. 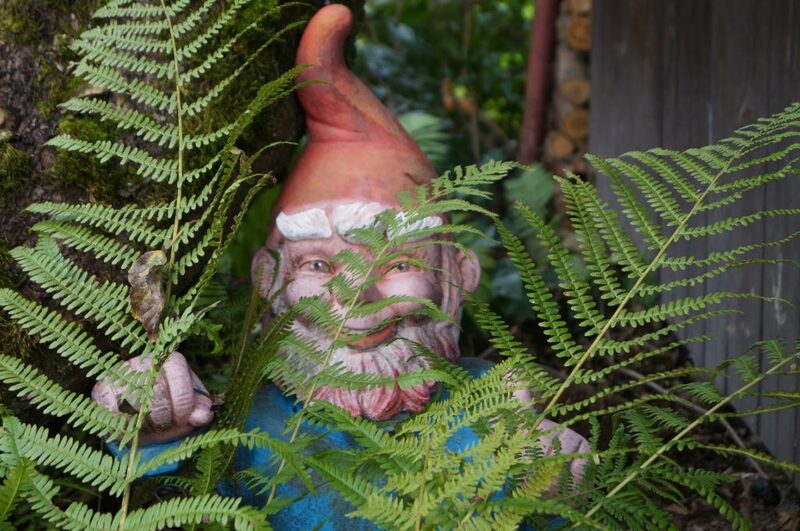 Say hi on Twitter @davidcook100 to discuss the sinister nature of garden gnomes.